Pontypridd lock Chris Dicomidis has joined Cardiff Blues on a full-time basis on a long-term deal. 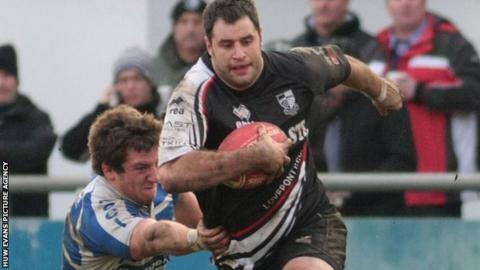 The 29-year-old has been a key figure for Pontypridd over the last decade and was appointed captain in 2010. Dicomidis represented Wales at Under-19 and Under-21 levels as well as the Barbarians and has played for Cyprus. "I'm excited about the opportunity to become part of the Blues squad and taking my chance at professional rugby," he said. Dicomidis is the second big name to leave Pontypridd for the Blues during recent weeks. Ponty head coach Dale McIntosh left his role at Sardis Road to become the region's new defence coach in October. "You always hope you'll get the call to join a full-time set-up and I've spoken to Dale about the region and what is expected," Dicomidis said. "I'm determined to grasp this opportunity with both hands and show what I can achieve." Blues director of rugby Phil Davies said: "He will strengthen our second row resources, with Lou Reed and Bradley Davies currently sidelined, and I know he is determined to take this opportunity. "We are excited to see what he can achieve in a full-time professional environment."